We provide materials & products testing, analysis & characterization to customers across a wide range of industries - providing solutions, not just numbers. Outsource your QA / QC? Determine if your material / product is fit for purpose? 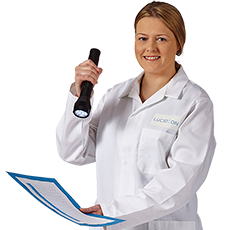 Lucideon is a UKAS accredited testing (0013) and calibration (0420) laboratory in the UK. Lucideon works closely with several laboratories overseas that are audited by Lucideon on an annual basis. Click here for our full list of UKAS accredited tests [PDF File]. The rigorous quality assurance requirements mandated by ISO 17025, Nadcap (aerospace and defense industry) and 10 CFR 50 Appendix B (nuclear utility industry) are applied to each and every job we perform, regardless of whether it requires conformance to any of these accreditations. We also maintain a GE Transportation and Aviation Special Process Certification to perform many S-400 test codes. How does our Quality Assurance Program help you? It assures you that every job you submit to us will be performed to exacting standards for accuracy, reliability, and traceability. At Lucideon, we live and breathe quality. We consistently apply proven technologies to deliver the highest level of excellence to you. » Accreditation certificates for Lucideon in the US are available here.